Without Cacao Nibs there would be no chocolate! Cacao nibs are the roasted pieces of Cacao Beans, which are ground to make chocolate. They make fun additions to your favorite recipes, are a healthful and crunchy snack food, and of course are great with all chocolate desserts. A Wine Country Chocolates favorite. Creamy caramel dances around fluffy marshmallows, rich dark chocolate, and crunchy almonds. No need for a spoon with this Rocky Road! Your inner-child will jump up and down with glee at the first taste of our Caramel Rocky Road. It has been a favorite with our fans since the very beginning. Incredible dried mission figs delicately dipped in dark chocolate. They’re a uniquely impressive gift for a “foodie” friend, or for yourself. Just like chocolate, figs have a long rich history, and are believed to be one of the first fruits cultivated by humans. 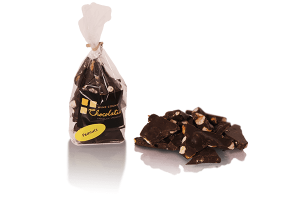 Plump and chewy dried apricots dipped in our signature dark chocolate. A richly elegant dessert or midday indulgence, FYI, they’re wonderful with champagne! At Wine Country Chocolates we believe that getting your 5 daily servings of fruit is much more appealing when the fruit is dipped in chocolate! Large pretzels sticks dipped in intense, rich dark chocolate and coated in a sprinkling of sea salt. Ahem, they’re salty-sweet goodness! What a perfect souvenir from Wine Country! 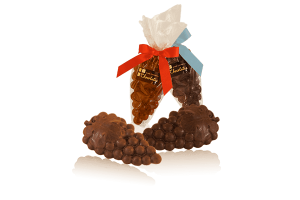 Our 4-inch grape clusters are molded out of 61% cacao dark chocolate. Pair them with a bottle of your favorite Sonoma Valley wine. When it comes to our pure chocolate confections, only the best chocolate will do. 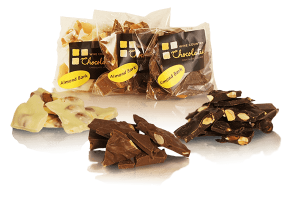 Our chocolate source is Guittard, the oldest family owned and operated chocolate company in the United States. Nonpareil is French for “without equal,” which you’ll certainly find is true with these timeless, fun candies. 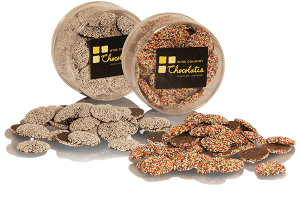 Small dark chocolate disks decorated with sugar nonpareil sprinkles. Nonpareils are a simply irresistible classic candy that are not only beautiful to look at, but also undeniably tasty. Much easier wine bottles to transport home in your luggage! 3-inch bottles, molded out of exquisite dark chocolate and wrapped in colored foil. When it comes to our pure chocolate confections, only the best chocolate will do. 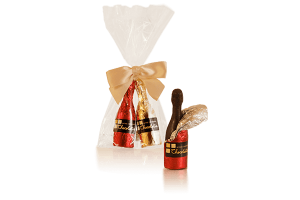 Our chocolate source is Guittard, the oldest family-owned and operated chocolate company in the United States. Sweet & salty fans rejoice! 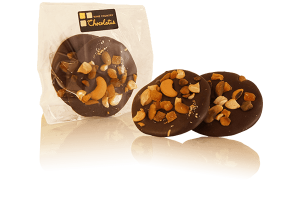 Tasty honey roasted peanuts clustered and coated in dark chocolate. Too enticing to pass up. 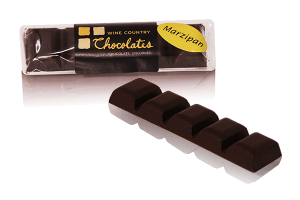 Wine Country dark chocolate with a marvelously rich almond marzipan center. Simply superb. 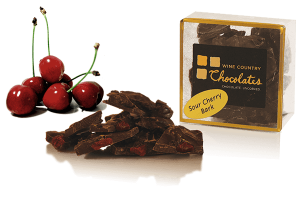 At Wine Country Chocolates we strive to find the freshest, and most natural ingredients possible. Very popular with our young guests, and those who are young at heart. We mold our 38% cacao milk chocolate into whimsical grape clusters. Very tasty, but doesn’t count as a serving of fruit! When it comes to our pure chocolate confections, only the best chocolate will do. 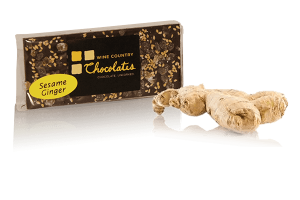 A fun milk chocolate alternative to the more traditional dark chocolate French confections. Often used to adorn cakes and gingerbread houses, they’re a pleasure on their own. Nonpareils are a simply irresistible classic candy that are not only beautiful to look at, but also undeniably tasty.